Mercury is the planet that rules the way we communicate and use our reasoning. How we speak, think and read is all determined by its positioning on our birth chart. 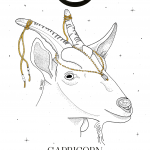 Ready to know more about Mercury in Capricorn? Earth is the element of Capricorn (just as Taurus and Virgo) and Saturn is its ruling planet. Mercury has the quickness as the main feature. The energy of the element earth brings a bit of rigidity of thought. This combination will give rise to a more controlling mind. Whoever has Mercury in Capricorn must be a very responsible and restrained individual in their actions. They will hardly act on impulse because they like to think calmly and intently about things. Unlike Mercury in Taurus that carries a bit of laziness, what these people have is parsimony. They are ambitious and do not shy away from going after what they want. But they can handle the anxiety to calculate their steps precisely. They have as one of the greatest goals achieving wealth and material security. It will be very valuable to save a little every month to accumulate a reserve. There is practically no one who have Mercury in Capricorn who do not think of money that way. They are distrustful, skeptical, and do not often believe in what they hear first. They have a hard time trusting others and will always investigate if there is truth behind. And the lack of trust makes them be spared in what they say about themselves to others. They think twice before passing on some information about their personality. This suspicious side makes Mercury in Capricorn have a taste of going deeper into things. They like to look for and find evidence, even if it takes work. Therefore, they can choose scientific and investigative professions, not least because they are not afraid to enter into long projects that will last a lifetime. They also has good math and administrative skills. Usually, they carry a good power of focus and concentration. These people will not get lost in distractions while performing their tasks. For them, if a mission is given, it will be fulfilled with the utmost dedication. Mercury in Capricorn: why so serious? These people have to be careful to not isolate themselves too much from others. Paranoia for being responsible and systematic all the time can cost a social life that everyone should have. Dedication to work can always be balanced with pleasure. Being comfortable in a chat with co-workers seems impossible to these people. Also because this Mercury has a hard time relaxing and accepting new ideas. So they prefer to be alone than to expose themselves and be displeased. Since they only value ideas that have a practical side, they will not have much patience with healthy jokes and daydreams of others. Do you know those people who have no sense of humor and are amused at anything? Mercury in Capricorn! It is important to not be a victim of their own discipline and to stimulate social relations. That way, they will be able to put some color and life into their lives.